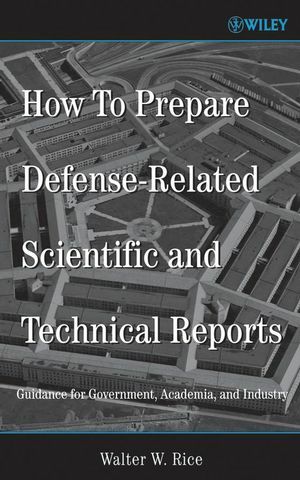 This book provides thorough and specific guidance on how to prepare defense-related scientific and technical reports, including classified scientific and technical reports. It includes an appendix describing the workings of the Defense Technical Information Center, the central repository for defense-related scientific and technical reports, and an appendix addressing tone and style, including pertinent information from the United States Government Printing Office Style Manual 2000, the official style guide of the U.S. Government and, therefore, the Department of Defense. Every facet of preparing defense-related scientific and technical reports is addressed, thereby making it unnecessary for the user to have to refer to the standards and numerous regulations pertaining to this subject. In effect, the book provides "one-stop shopping" for the user. Also, some of the official guidance on preparing defense-related scientific and technical reports requires interpretation, and in those cases the book provides a prudent analysis of that information and prescribes a "best practices" course for the user. Walter W. Rice is a senior technical writer/editor with the Johns Hopkins University Applied Physics Laboratory (APL). He has more than twenty-nine years experience in the field of technical communication, twenty-two of which were in the U.S. Government, primarily DoD. He is a member of the Society for Technical Communication. The APL Subcommittee of the Sabbatical Fellows and Professors Programs appointed him a Stuart S. Janney Fellow to write this book. Chapter 2. Organization and Design. Appendix A. Defense Technical Information Center (DTIC). Appendix B. Tone and Style.